I have got Hanse 345 with 3 cabin. Very nice boat. I need to replays tank waste with a new bigger but I don't know how to unmount it. Could you explain me the correct procedure? you have to unscrew the panel and then you get access to the plastic tank behind. Be aware, that the plastic tank is using the available room to a large extent. Eventually you have to destroy the 30 ltr tank. But the alternative might be that much bigger. 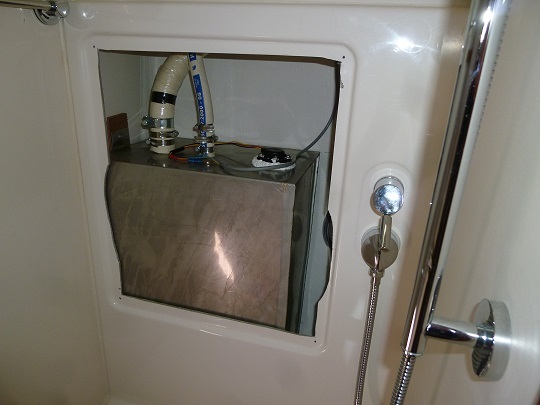 I have the 2 cabin version and was able to install an additional 50ltrs tank in the space behind the shower. This one is connected to the plastic black water tank. In addition I have a 120 ltr grey water tank in the port cockpit locker.